May 2, 2015 – PVP: Toxis defeated Delmi Exo in a dark match. July 31, 2015 – UvT: Maximum Mecca and Scotty Wild defeated Delmi Exo and Tomahawk. August 29, 2015 – UvT: Team Sea Stars (Ashley Vox and Delmi Exo) defeated Ariela Nyx and Maximum Mecca. September 12, 2015 – PVP: Delmi Exo defeated Tequila Rosee in a dark match. September 26, 2015 – ElkMania 3: Ashley Vox defeated Delmi Exo. October 10, 2015 – UvT: Team Sea Stars (Ashley Vox and Delmi Exo) defeated Katred and Toxis. October 24, 2015 – PVP: Delmi Exo and Nate Nastic defeated Ryan Malice and Tequila Rosee. November 7, 2015 – PVP: Ashley Vox defeated Delmi Exo. November 15, 2015 – LPW: Delmi Exo and Vern Vicallo defeated Tequila Rosee and Tomahawk in the 1st round. Anthony Greene and Tessa Blanchard defeated Delmi Exo and Vern Vicallo in the semi-finals. November 21, 2015 – NECW: Deonna Purrazzo and Sumie Sakai defeated Team Sea Stars (Ashley Vox and Delmi Exo). 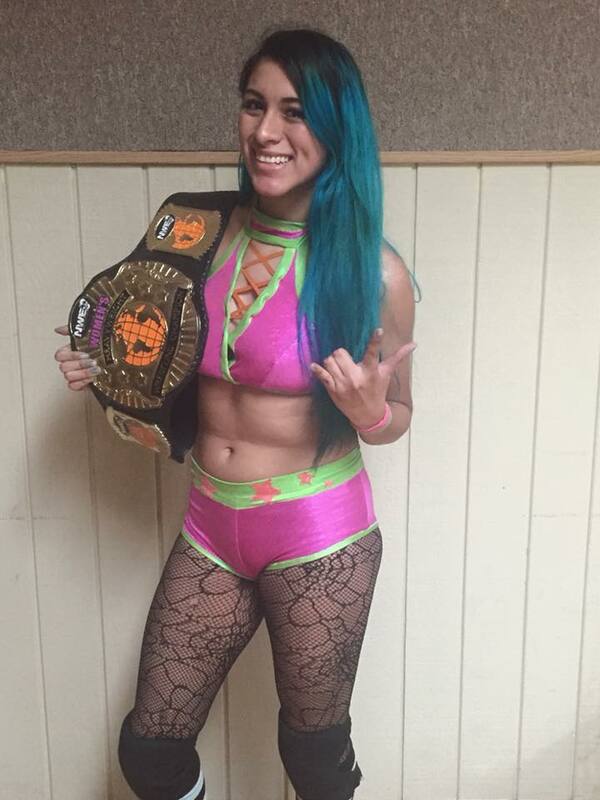 December 12, 2015 – Blitzkrieg Pro: Team Sea Stars (Ashley Vox and Delmi Exo) defeated Ariela Nyx and Leva Bates. January 9, 2016 – Blitzkrieg Pro: Katred and Toxis defeated Team Sea Stars (Ashley Vox and Delmi Exo). January 30, 2016 – PVP: The Angels (Delmi Exo and Maximum Mecca) defeated The Beauty And The Beast (Ashley Vox and Toxis). February 6, 2016 – National Pro Wrestling Day: Nutrious X defeated Delmi Exo, Ken Broadway and The Proletariat Boar Of Moldova in a 4-way elimination 1st round match of the Young Lions Cup. February 27, 2016 – LPW: Tequila Rosee defeated Adira, Ashley Vox, Delmi Exo, Maximum Mecca, Nikki Valentine and Ramona Romano in a battle royal to become #1 contender for the women’s title. March 5, 2016 – PVP: Delmi Exo defeated Ashley Vox in the semi-finals. March 12, 2016 – IYFW: Kenedi Copeland and La Diva defeated Ashley Vox and Delmi Exo. March 26, 2016 – Blitzkrieg Pro: Katred defeated Ariela Nyx, Ashley Vox, Delmi Exo, Maximum Mecca, Sarah D’Arrico, Skylar and Toxis in a battle royal where the winner will face Kimber Lee. April 2, 2016 – CHIKARA: Los Ice Creams (El Hijo del Ice Cream and Ice Cream Jr.) defeated Team Sea Stars (Ashley Vox and Delmi Exo) in the 1st round. April 9, 2016 – PVP: Toxis defeated Delmi Exo to win the tournament and vacant women’s title. May 14, 2016 – LPW: Delmi Exo defeated Hellen Vale. May 21, 2016 – PVP: Toxis and Wrecking Ball Legursky defeated Delmi Exo and Doug Summers. June 25, 2016 – PVP: Tequila Rosee and Toxis defeated Delmi Exo and Skylar. July 9, 2016 – PVP: Doug Summers defeated Delmi Exo, Maximum Mecca and Skylar in a handicap match. August 13, 2016 – NECW: Team Sea Stars (Ashley Vox and Delmi Exo) defeated Kaitlin Diemond and Toxis. August 20, 2016 – LPW: Davienne defeated Ashley Vox to retain the women’s title. Delmi Exo defeated Christopher James in a Pie in the Face match. August 27, 2016 – Blitzkrieg Pro: Team Sea Stars (Ashley Vox & Delmi Exo) and Skylar defeated Ariela Nyx, Katred and Toxis. September 4, 2016 – CHIKARA: Billy Gunn & Sean Waltman defeated The Devastation Corporation (Blaster McMassive & Flex Rumblecrunch) and N_R_G (Hype Rockwell & Race Jaxon) and Team Big Deal (Rick Roland & Sloan Caprice) and Team Sea Stars (Ashley Vox & Delmi Exo) and Los Ice Creams (El Hijo del Ice Cream & Ice Cream Jr.) and Dez Peloton (Donald Kluger & Jasper Tippins) and Cornelius Crummels & Sonny Defarge and Hermit Crab & Rock Lobster and Drew Gulak & Orange Cassidy and Prakash Sabar & The Proletariat Boar Of Moldova in a tag team gauntlet. September 10, 2016 – PVP: Delmi Exo defeated Ashley Vox. September 30, 2016 – PVP: Toxis defeated Delmi Exo and Skylar in a 3-way match to retain the women’s title. October 22, 2016 – PVP: Ashley Vox defeated Delmi Exo in a best 2 out of 3 falls match. November 5, 2016 – ACW/Rogue: Delmi Exo defeated Azaelle. November 5, 2016 – CHIKARA: Chuck Taylor and DUSTIN defeat Rick Roland and Sloan Caprice, Team Sea Stars (Ashley Vox and Delmi Exo) & N_R_G (Hype Rockwell and Race Jaxon) in a 4-way tag team elimination match. November 10, 2016 – RISE 1: The Buru Death Squad (Kikyo and Roni Nicole) defeated Team Sea Stars (Ashley Vox and Delmi Exo). November 12, 2016 – PVP: Lobo and Toxis defeated Delmi Exo and Nick King in a dark match. December 3, 2016 – PVP: Skylar defeated Delmi Exo to retain the women’s title. December 15, 2016 – CHIKARA: Team Sea Stars (Ashley Vox and Delmi Exo) defeated Benny The Beele and Hiptoss Hank. Los Ice Creams & Princess KimberLee (El Hijo del Ice Cream and Ice Cream Jr.) defeated Solo Darling & Team Sea Stars (Ashley Vox and Delmi Exo). December 22, 2016 – CHIKARA: Xyberhawx 2000 (Razerhawk and Sylverhawk) defeated Team Sea Stars (Ashley Vox and Delmi Exo). Delmi Exo was also in the Infinite gauntlet match won by Dasher Hatfield. January 28, 2017 – PVP: Skylar and Toxis defeated Team Sea Stars (Ashley Vox and Delmi Exo). February 4, 2017 – National Pro Wrestling Day: Space Monkey defeated Ashley Vox, Delmi Exo and Merlok in a 4-way, 1st round match of the Young Lions Cup. February 8, 2017 – CW: Davienne defeated Delmi Exo to retain the women’s title. February 18, 2017 – QOC 17: The Lucha Sisters (Leva Bates and Mia Yim) defeated Team Sea Stars (Ashley Vox and Delmi Exo) in the 1st round. February 18, 2017 – QOC 18: The Fella Twins (Eddy McQueen and Rick Cataldo) defeated Team Sea Stars (Ashley Vox and Delmi Exo). April 1, 2017 – CHIKARA: Team Sea Stars (Ashley Vox & Delmi Exo) and Obariyon defeated Cajun Crawdad, Hermit Crab and Merlok. April 8, 2017 – ACW/Rogue: Sally defeated Delmi Exo to retain the Rogue Women Warriors title. April 15, 2017 – NWE: Delmi Exo defeated Elhandsomo. May 6, 2017 – CHIKARA: Delmi Exo was in the Infinite Gauntlet match won by Solo Darling. May 13, 2017 – NWE: Delmi Exo defeated Ashley Vox and Jawsolyn in a 3-way match. May 20, 2017 – WWR: Team Sea Stars (Ashley Vox and Delmi Exo) defeated The Onterribles (Kaitlin Diamond and Leah Vaughan). May 27, 2017 – CHIKARA: Xyberhawx 2000 (Razerhawk and Sylverhawk) defeated Team Sea Stars (Ashley Vox and Delmi Exo), Cajun Crawdad and Hermit Crab & The Force (Officer Bruno Meloni and Officer Warren Barksdale) in a 4-way tag team elimination match. July 7, 2017 – Girl Fight/Queens Of Combat: Team Sea Stars (Ashley Vox and Delmi Exo) defeated The Fella Twins (Eddy McQueen and Rick Cataldo). July 14, 2017 – CW: Alisha Edwards defeated Delmi Exo. July 23, 2017 – CHIKARA: Cornelius Crummels, Sonny Defarge and The Whisper defeated The Furies (Ashley Vox, Delmi Exo and Obariyon). August 12, 2017 – PVP: Davienne defeated Delmi Exo. August 20, 2017 – WWR: Team Adams (Karen Q and Tasha Steelz) defeated Team Sea Stars (Ashley Vox and Delmi Exo). August 26, 2017 – TRUE Wrestling: Delmi Exo defeated Gemma Cross. September 16, 2017 – NWE: Delmi Exo defeated Ashley Vox. October 7, 2017 – ACW/Rogue: Jordynne Grace defeated Delmi Exo. October 8, 2017 – WWR: Alexxis Nevaeh and Taeler Hendrix defeated Team Sea Stars (Ashley Vox and Delmi Exo). October 14, 2017 – LPW: Adira defeated Davienne, Delmi Exo and Isana in a 4-way match to win the women’s title. October 18, 2017 – CZW Dojo Wars: Mike Del defeated Delmi Exo to retain the Medal Of Valor title. November 4, 2017 – WrestleJam 16: Ashley Vox, Delmi Exo and Skylar defeated Allie Recks, Karen Q and Sumie Sakai. November 17, 2017 – CW: Delmi Exo defeated Alisha Edwards and Davienne in a 3-way match to become #1 contender for the women’s title. November 18, 2017 – NWE: Delmi Exo defeated Miss Gia in the semi-finals. Delmi Exo defeated Davienne to win the tournament and vacant women’s title. November 29, 2017 – CZW Dojo Wars: Maria Manic defeated Delmi Exo. December 8, 2017 – CW: Ashley Vox defeated Delmi Exo to retain the women’s title. January 12, 2018 – CW: Ashley Vox defeated Delmi Exo to retain the women’s title. January 20, 2018 – QOC 20: Ruthless Ambition (Maria Manic and Penelope Ford) defeated Team Sea Stars (Ashley Vox and Delmi Exo). January 21, 2018 – QOC 21: Team Sea Stars (Ashley Vox and Delmi Exo) defeated The Pretty Mean Girls (Madi Maxx and Renee Michelle). January 28, 2018 – WWR: Holidead defeated Delmi Exo. Delmi Exo was also in the Revolutionary Rumble won by Jordynne Grace. February 10, 2018 – WOW: The Twisted Sisters (Holidead and Thunder Rosa) defeated Team Sea Stars (Ashley Vox and Delmi Exo). February 21, 2018 – Live Pro Wrestling: Allie Recks defeated Delmi Exo. February 23, 2018 – CW: Alisha Edwards and Davienne defeated Ashley Vox and Delmi Exo. March 25, 2018 – WWR: Faye Jackson defeated Delmi Exo in a dark match. April 21, 2018 – NWE: Delmi Exo defeated Ally Zwicker by disqualification to retain the women’s title. April 27, 2018 – ICW: Delmi Exo defeated Isana. April 28, 2018 – Dynasty: Xtina Marie defeated Delmi Exo. May 27, 2018 – WWR: Allie Recks defeated Delmi Exo. June 16, 2018 – WSU: Madi Maxx defeated Delmi Exo. June 22, 2018 – MSWNB: Delmi Exo defeated Huracan Flaco. June 23, 2018 – NWE: Delmi Exo defeated Ally Zwicker to retain the women’s title. July 14, 2018 – WWR: Oceanea defeated Delmi Exo. July 20, 2018 – Let’s Hang Out! – A Collaborative Effort By LVAC & BWA: Delmi Exo defeated Riley Shepard. July 21, 2018 – NCW: Delmi Exo defeated Isana. Isana and The Lumberjake defeated Delmi Exo and Shay Cash. August 3, 2018 – BTW: James Ellsworth defeated Delmi Exo to retain the World Intergender title. August 25, 2018 – NWE: Delmi Exo defeated Jasmine Hawkes to retain the women’s title. September 1, 2018 – NCW: The Platinum Hunnies (Angel Sinclair and Ava Everett) defeated The Boys Next Door (Davienne and Delmi Exo). September 30, 2018 – Wrestlers’ Lab: Team Sea Stars (Ashley Vox and Delmi Exo) defeated The Diamond Dogs (Graham Bell and Luke Langley). October 12, 2018 – NCW: Delmi Exo and Sierra defeated The Platinum Hunnies (Angel Sinclair and Ava Everett). October 28, 2018 – WWR: Delmi Exo defeated Terra Calaway by disqualification. November 8, 2018 – DCW: Doomfly (Delilah Doom and Eli Everfly) defeated Team Sea Stars (Ashley Vox and Delmi Exo) in the quarter-finals. November 9, 2018 – HMW: Team Sea Stars (Ashley Vox and Delmi Exo) defeated Alex Gracia and Jody Threat. November 10, 2018 – Sabotage: Baby D and Phoebe defeated Team Sea Stars (Ashley Vox and Delmi Exo) to retain the tag team titles. December 7, 2018 – NeoFight: Eran Ashe and Leyla Hirsch defeated The REP (Dave McCall and Nate Carter) & Team Sea Stars (Ashley Vox and Delmi Exo) in a 3-way tag team, semi-finals match. December 18, 2018 – NEW: Karen Q defeated Delmi Exo. December 30, 2018 – Beyond Tournament For Tomorrow: Team Sea Stars (Ashley Vox and Delmi Exo) defeated BCAD (Harlow O’Hara and Terra Calaway) in the 1st round. The Twisted Sisters (Holidead and Thunder Rosa) defeated Team Sea Stars (Ashley Vox and Delmi Exo) in the semi-finals. January 5, 2019 – ROH TV (Taped): Jenny Rose and Sumie Sakai defeated Team Sea Stars (Ashley Vox and Delmi Exo) in a dark match. January 18, 2019 – BCW: Kris Statlander defeated Brandi Lauren and Delmi Exo in a 3-way, 1st round match. February 17, 2019 – FEST: Team Sea Stars (Ashley Vox and Delmi Exo) defeated Effy Loves Beastly (Beastly Brody and Effy Gibbes) in the 1st round. The Gym Nasty Boyz (Timmy Lou Retton and White Mike) defeated Team Sea Stars (Ashley Vox and Delmi Exo) in the semi-finals. February 23, 2019 – WWR: BCAD (Harlow O’Hara and Terra Calaway) defeated Team Sea Stars (Ashley Vox and Delmi Exo) in a no disqualification tag team match. March 2, 2019 – CZW: Delmi Exo defeated JGeorge and Pat Buck in a 3-way, 1st round match. Matt Travis defeated Anthony Bowens and Delmi Exo to win the Trifecta. March 16, 2019 – QOC: Team Sea Stars (Ashley Vox and Delmi Exo) defeated Trish Adora and Veda Scott. March 23, 2019 – WSU: Aja Perera defeated Delmi Exo. March 29, 2019 – RISE 13: The Blue Nation (Charli Evans and Jessica Troy) defeated Team Sea Stars (Ashley Vox and Delmi Exo) to become #1 contenders for the Guardians Of The RISE titles. March 30, 2019 – SHIMMER Volume 109: Cheerleader Melissa and Mercedes Martinez defeated Team Sea Stars (Ashley Vox and Delmi Exo) to retain the tag team titles. March 31, 2019 – SHIMMER Volume 111: Leva Bates defeated Delmi Exo, Miranda Alize and Zoe Lucas in a 4-way match. April 3, 2019 – BCP: Leva Bates and Solo Darling defeated Team Sea Stars (Ashley Vox and Delmi Exo). @beyondwrestling @MrHatfield4 @The_MJF @indiewrestling @itsvedatime @DelmiExo @WWRProWrestling @JANELABABY @DirtyDickinson @SilverNumber1 @YTAlexReynolds @retroag @JoeyRyanOnline @SupercopJUSTICE @pufisgod @SoloDarling @ashley__vox Is this going to be streaming anywhere? @beyondwrestling @MrHatfield4 @The_MJF @indiewrestling @itsvedatime @DelmiExo @WWRProWrestling @JANELABABY @DirtyDickinson @SilverNumber1 @YTAlexReynolds @retroag @JoeyRyanOnline @SupercopJUSTICE @pufisgod @SoloDarling @ashley__vox This is a upgrade! @DelmiExo The fact that that trailer made him so happy he cried, makes me so happy! !